Yesterday, we lowered the mattress in Hendrik's crib. He's been a bit of a monkey lately, sitting up from laying down, and then pulling himself up to standing from sitting - so for the past few nights and naptimes, I've been pretty nervous that he'd stand up in his crib and then topple over the railing. 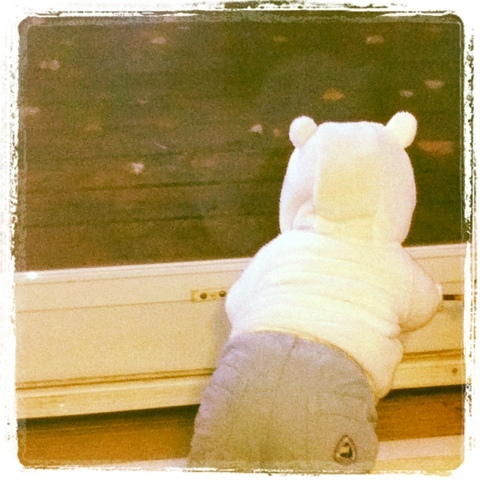 Especially because when Brian went to get him up the other day he was sitting up in his crib beside the railing. We didn't have the time to fix the crib that night, so instead we took two of the couch cushions and put them on the floor beside the crib - at least he wouldn't break his neck? Standing up all by himself! This year, Isabelle is thankful for the many many gooses that she got to chase early this morning. Isn't it interesting how closely linked smells, tactile sensations, and sounds are linked to memories? This past weekend, Brian and I were in Gananoque celebrating our 5th anniversary. While we were driving around looking for a suitable place to eat dinner (the end result of which is an entirely different and long story), we happened to end up in the exact location of one of my favourite 5 year old memories. The photo below shows the view that we had on Saturday from our van. The left side of the street is where you are to park if you are going to be going on the 1000 Islands Boat Tour, which we were, in my memory. We parked where that one white minivan is parked underneath the minus sign at the top left. The red brick building on the right is the ticket office. I have a sneaking suspicion that it may have also housed a haunted house at the time, because I distinctly remember visiting a haunted house before going on the trip. Or perhaps not, perhaps we just went to the gift shop in the building beside the ticket office. That's where I got my necklace and bracelet set. Both strands had about 5 white beads in a row, with hearts in rainbow colours stacked slanted inbetween that and another line of white beads. I wore those until the elastic on the bracelet snapped and the clasp on the necklace broke. I digress. The reason why I remember this event so very clearly is because of my shoes. That fall I started kindergarten, which meant that I got new shoes. After 4 years of watching my siblings go back to school shopping, I don't know if you can comprehend just how excited I was about this. I remember standing in the parkinglot behind whichever vehicle it was that we had then - probably Fritz (though they were all that, because that's what our licence plate sounded like, only the Olds was actually Fritz) - and my feet were so happy. I was wearing new purple socks. There's something about wearing a new pair of socks for the first time: everything about the socks is new and fresh - and they're so soft and cushy, like a little piece of high pile carpet under your foot wherever you go. I was also wearing my brand new white Reebok tennis shoes. They were like my mom's shoes, but my size. And that was so cool. (Hey, I never said that *I* was cool, and there's a very good reason for that.) The combination of wearing new socks in new shoes is pretty much like wearing a brand new pair of slippers. Outside. Awesome. After this moment, we went to get our tickets, and then I bought my necklace and bracelet, and then we went on the boat cruise. But I remember that parkinglot. And the shoes. And the socks. And I was so excited. It was a great day. More on smells and sounds later.